Aidan O'Brien landed his second Classic of the weekend as Homecoming Queen sprang a 25-1 shock in the Qipco 1000 Guineas at Newmarket. The race has been dominated by Irish-trained runners in recent years with 6 of the last 10 going to horses from across the Irish Sea. Racing Post Trophy third Fencing is on schedule to make the line-up for the £350,000 Group One QIPCO 2000 Guineas at Newmarket on Saturday, May 5, despite missing an intended reappearance at the Craven meeting last week. Maybe is one of 24 fillies going forward in the QIPCO 1000 Guineas, run on Sunday, May 6, following the April 24 scratchings’ deadline. Having landed the Nell Gwyn Stakes on Wednesday, the Richard Hannon team made it Guineas trial a double on Thursday by landing the Craven Stakes with the very impressive Trumpet Major. The Brian Meehan-trained Most Improved, a 20/1 shot in the ante-post market in Qipco 2000 Guineas betting, just two weeks ago, is now a general 5/1 second favourite as money continues to pour in for the son of Lawman. 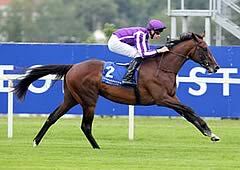 Aidan O'Brien's Camelot is the star name among 63 entries for the Qipco 2000 Guineas at Newmarket on May 5. Trainer Aidan O'Brien and the Godolphin team dominate a cosmopolitan 70-strong entry for the Qipco 1000 Guineas at Newmarket on May 6. Camelot is the 4-1 favourite with Coral for the Qipco 2,000 Guineas, and 3- 1 market leader for the Investec Derby, after the Racing Post Trophy winner was rated the joint-top two-year-old in the World Thoroughbred Rankings. Coral has eased Born To Sea to 10-1 (from 7-1) for next year's Qipco 2,000 Guineas, after the half-brother to Sea The Stars lost his unbeaten record at Leopardstown this afternoon. His conqueror at the Irish track, Nephrite, is also 10-1 for the colts' Classsic. Noble Mission performed with plenty of credit on his much-anticipated debut at Yarmouth to finish second to Godolphin newcomer Swedish Sailor. The unbeaten juvenile filly Maybe, currently 5/1 favourite for next season's 1000 Guineas, will not run again this season, returning next term to bid for the first fillies' classic of 2012. Aidan O’Brien has another exciting Classic prospect on his hands in the form of the blue-blooded Wading, who stormed to a two-length triumph in the Group Two Vision.ae Rockfel Stakes. Samitar landed the big pot she richly deserved in the £300,000 Tattersalls Millions 2yo Fillies' Trophy on Saturday 1st October. Lyric Of Light is 8-1 (from 10-1) with Coral for next year's Qipco 1,000 Guineas, and 10-1 (from 16-1) for the Investec Oaks, following her victory in the Shadwell Fillies' Mile at Newmarket. Maybe stretched her unbeaten record to five with a thoroughly professional performance in the Moyglare Stud Stakes at the Curragh. Coral has introduced Dabirsim into their Qipco 2,000 Guineas betting at 14- 1, after the colt maintained his unbeaten record in this afternoon's Prix Morny at Deauville. La Collina collared Power close home to land a 33-1 surprise success in the Group One Keeneland Phoenix Stakes at the Curragh. Godolphin's Blue Bunting finished with a late surge to land the Qipco 1000 Guineas at Newmarket in the hands of Frankie Dettori. Frankel took the QIPCO 2000 Guineas in devastating style as jockey Tom Queally blazed ahead of his rivals to eventually finish six lengths clear. Eoghan O’Neill went close to 2000 Guineas glory four years ago when he saddled 33/1 shot Vital Equine to finish runner-up behind Cockney Rebel and the French-based Irishman has another talented outsider for this year’s running of the £350,000 Classic in the shape of Broox. Frankel will face a maximum of 14 rivals when he puts his unbeaten status on the line in Saturday’s Qipco 2,000 Guineas at Newmarket. I Love Me, successful in a Tattersalls sales race on her debut last year, finished a close third behind Cape Dollar and Cochabamba in the seven-furlong Rockfel Stakes at Newmarket on October 16 last year and she will be returning to action in the QIPCO 1000 Guineas on Sunday, 1st May. Leading fancy White Moonstone will not run in the Qipco 1000 Guineas after pulling up stiff in her work on Saturday morning. Jessica Harrington is poised to unleash the unbeaten Pathfork and leading contender Laughing Lashes in the first two Classics of he season at Newmarket. Native Khan, trained by Ed Dunlop was the first of the 2000 Guineas contenders to strut his stuff this season, when he took on a competitive looking field in the Group Three, Craven Stakes over the eight furlongs of the Rowley Mile course at Newmarket earlier this week. This year’s Nell Gwyn may well have lacked any mature principals for next month’s 1,000 Guineas at Newmarket but the winner always commands a consideration for the initial fillies classic and Barefoot Lady, trained by Richard Fahey, may be supplemented. Richard Fahey has issued a warning to punters considering backing his unbeaten Wootton Bassett for the Qipco 2000 Guineas on April 30, suggesting that his stable star is only 50-50 to make the line-up for the big race. Henry Cecil’s red-hot ante-post 2000 Guineas favourite Frankel looks almost certain to have a prep race before bidding to land a mass of long-range bets in the first colts’ classic of the season at Newmarket on April 30. There are 79 fillies (up from 71 in 2010) entered for the Group One 1000 Guineas at Newmarket on Sunday, 1st May, including Godolphin’s Group One Fillies’ Mile heroine White Moonstone. Unbeaten colt Frankel heads a 52-strong entry for this year's Group One 2000 Guineas, which will mark the start of the inaugural British Champions' Series. After the completion of a five-year exclusive sponsorship agreement with StanJames.com for The Newmarket Guineas Festival, where the 2000 and 1000 Guineas are the world-class highlights of a 14-race programme, Newmarket Racecourse is now seeking a new commercial partner for the 2011 meeting. French raider Special Duty won the StanJames.com 1000 Guineas in dramatic circumstances after being awarded the race following a stewards’ enquiry. All the talk before today’s StanJames.com 2000 Guineas was of St Nicholas Abbey, who was sent off Evens favourite for the Classic, but he could finish only sixth as a new star emerged on the Rowley Mile in French raider Makfi who stormed to a length and a quarter victory at odds of 33/1. Kent-based trainer John Best has not yet tasted Classic success but has a live contender for Saturday’s StanJames.com 2000 Guineas at Newmarket in the shape of Inler. Connections of several leading contenders for both the StanJames.com 2000 Guineas and the StanJames.com 1000 Guineas were present at a media event held at Lord’s cricket ground in London yesterday, which was organised by Newmarket Racecourses. Trainer Andrew Balding is weighing up a possible double Classic raid at Newmarket next weekend with recent Listed scorer Lord Zenith aiming for glory in the StanJames.com 2000 Guineas on Saturday, 1st May, and progressive filly Pipette being considered for the StanJames.com 1000 Guineas the following day. Stan Moore believes that his Group One Fillies’ Mile runner-up Lady Darshaan is “the forgotten horse” ahead of the £400,000 StanJames.com 1000 Guineas, staged over a mile at Newmarket on Sunday, 2nd May. With the exception of the brilliant St Nicholas Abbey, currently 9/4 favourite for the 2,000 Guineas, Arcano was arguably the most impressive juvenile colt of the 2009 season. French trainer Criquette Head-Maarek has landed the StanJames.com 1000 Guineas on three occasions this year has entered Special Duty, the clear 7/2 favourite with Stan James for the first fillies’ Classic of the season for which there are 71 entries, six more than last year. Xtension has already exhibited top-class form on Newmarket’s Rowley Mile course and last season’s Group One Jumeirah Dewhurst Stakes third has pleased trainer Clive Cox with the progress he has made this winter ahead of a planned tilt at the StanJames.com 2000 Guineas. Mick Channon believes that his Group One StanJames.com 1000 Guineas hope Music Show will come on for her seasonal reappearance in the £65,000 Group Three Leslie Harrison Memorial Nell Gwyn Stakes (4.10pm) at Newmarket on Wednesday, April 14th. StanJames.com 1000 Guineas entry Eolith can already include a Group 1 and Group 2 winner among her victims and her trainer William Knight is hoping she can further enhance her credentials in 2010. Special Duty, winter favourite for the 1000 Guineas at Newmarket on May 2nd, has been pleasing her Chantilly-based trainer Criquette Head-Maarek ahead of a return to full training this season. Lillie Langtry stormed back to form with victory in the Tattersalls Timeform Fillies’ 800 to leave connections looking at a return to the Rowley Mile in May for the Stan James-sponsored 1000 Guineas next May. Sea The Stars lit up the Rowley Mile to land the 2009 stanjames.com 2000 Guineas in spectacular style. Ridden by Hills’s son Richard, Ghanaati was sent off at 20/1 and returned triumphant by a length and a half from Irish raider Cuis Ghaire. Any fears that the speedy Natagora would not stay the mile test of the stanjamesuk.com 1000 Guineas were firmly rebuffed when the statuesque grey filly made all to claim victory. Trainer Aidan O’Brien landed his fifth stanjamesuk.com 2000 Guineas when winning the 200th running of the Classic after Henrythenavigator battled to beat the 11/8 favourite New Approach by a nose. Michael Prosser, Director of Racing at Newmarket, has this afternoon changed The NatWest Rowley Mile official going description after an upturn in the weather. Trainer Jim Bolger today expressed his confidence ahead of ante-post favourite New Approach’s bid for Classic glory in the stanjamesuk.com 2000 Guineas at Newmarket on Saturday, May 3. Stimulation is one of 30 horses going forward after yesterday’s forfeit stage for what promises to be a fantastic renewal of the £375,000 stanjamesuk.com 2000 Guineas at Newmarket on Saturday, May 3, and trainer Hughie Morrison believes there is more to come from the Choisir colt. Chelsea FC’s Peruvian striker Claudio Pizarro could have his first runner in an English Classic with Raymi Coya, who is among 28 fillies remaining in the £375,000 stanjamesuk.com 1000 Guineas, which takes place on Sunday, May 4, at the forfeit stage. French raider Special Duty won the StanJames.com 1000 Guineas in dramatic circumstances after being awarded the race following a stewards’ enquiry. Prince Khalid Abdulla’s Special Duty finished a nose behind 66/1 chance Jacqueline Quest, trained by Henry Cecil, but after an enquiry into interference she received the race. The Rowley Mile Course has been home to the first two of the five great "classic" Races, the One Thousand Guineas and the Two Thousand Guineas, since 1814 and 1809 respectively. The Guineas meeting, held at the historic Newmarket course, hosts the first Classics of the Flat season. The 2,000 Guineas is for three-year-old colts and fillies and is run on the famous Rowley Mile course. Newmarket has been recognised as the Headquarters of Racing for over 300 years. Some 3000 horses are in training in the immediate vicinity of this unique racing town, set in the heart of East Anglia, yet only sixty minutes from London by road or rail.